LG’s new Ultra HD TV on show at the CES. 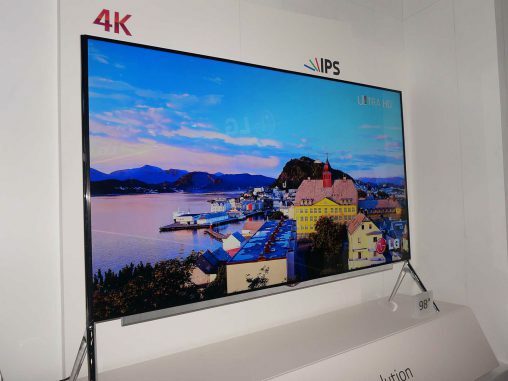 The early stages of the 2014 International CES have been dominated by the well-known TV brands jostling to get their bigger and better Ultra HD displays out in front of show visitors and onto the websites of tech blogs worldwide. One thing is for certain: Ultra HD, of 4K as some call it, has the biggest buzz here in Las Vegas. But like any nascent category, there are questions about Ultra HD uptake and whether the bluster matches the performance of the category. Speaking at the show to LG Australia general manager of marketing, Lambro Skropidis, Digital Retailer heard first-hand about one of the major brands’ views on the Ultra HD space. According to Skropidis, smaller Ultra HD screens in the 55 to 65-inch spectrum have “helped to bring the price point down” after the first wave of early-adopter launches, and the category is showing real strength. “The category has just taken off — absolutely,” he said. “In the 6-to8 weeks, we’ve been getting record numbers of Ultra High Definition sales. And in fairness to all players, it is not just us, Sony and Samsung are doing well out of the category as well. While it’s certainly an exciting technology on show at CES, it’s also a popular one — all of the big four TV brands feature sizeable Ultra HD displays at the entry of their stands, and all the talk is about wow factor. But with so many brands pushing the Ultra HD message, including the tier two players brands, what sets them apart? I put it to Skropidis that, when the picture on an Ultra HD TV looks so much more impressive than on a Full HD or HD TV, consumers will be wowed regardless of what brand they’re looking at. For his part, Skropidis said “not all Ultra HD TVs are created equal”. “They have processing engines inside them that basically create the picture you’re looking at,” he said. “So we believe our technology is different to competitors, we’re delivering a higher-end picture quality that is making the price warranted.